It can't be; and it's not. This Capt. 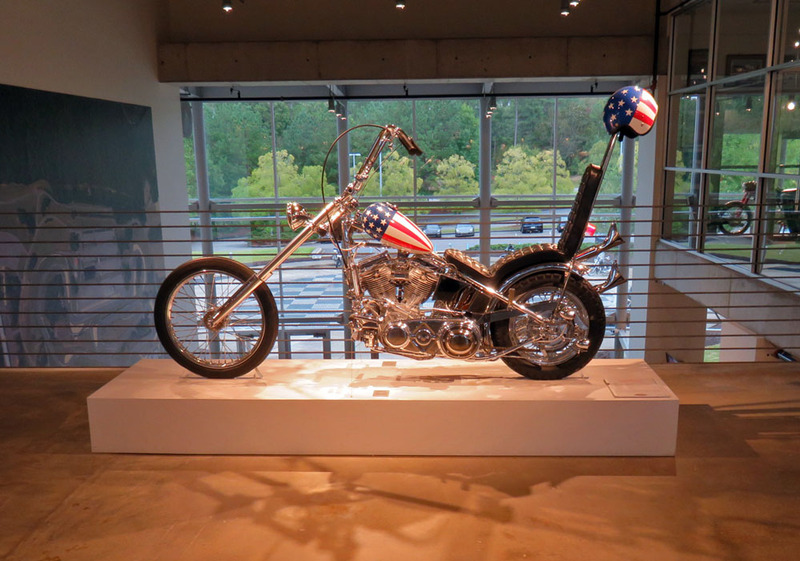 America bike like the one in "Easy Rider" is a replica. 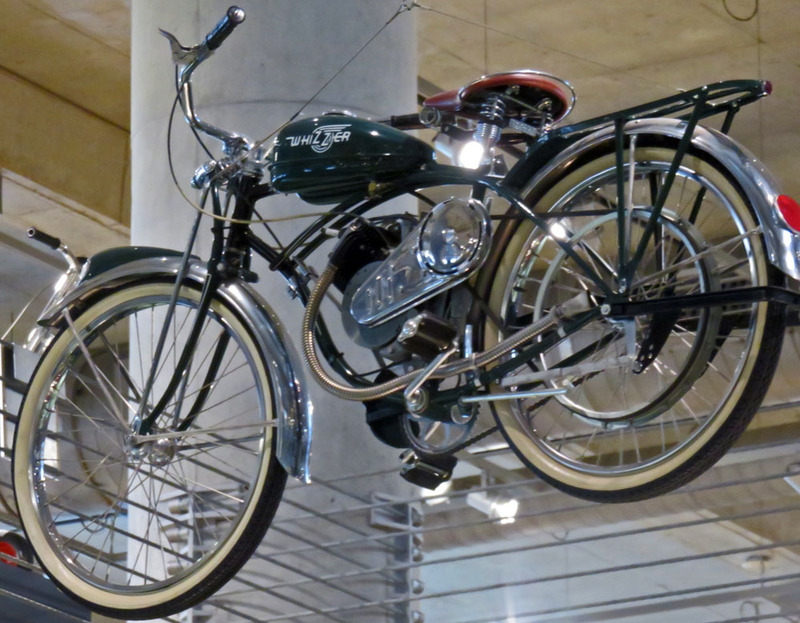 For me, classic Royal Enfield motorcycles were the stars of the Barber Vintage Motorsports Museum in Birmingham, Ala. But of course the enormous museum displays hundreds of other motorcycles and cars, especially Lotus cars. It claims to have the largest collection of Lotus automobiles and they are among the first things you see as you enter. Familiar from photographs, Lotus cars are surprising, even shocking in person. The most dramatic, for me, was a "see through" 1957 Lotus 14. Unpainted 1957 Lotus 14, lit from inside, demonstrates how lightly built it was. 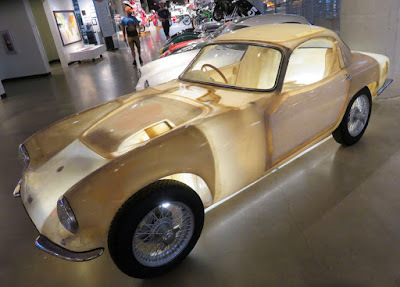 "The Museum decided not long after its purchase to leave the car unpainted to showcase Lotus founder Colin Chapman's genius design of a fiberglass monocoque," signage explains. "Chapman was all about keeping it light and simple." In this car fiberglass is almost the only material used. Steel frame is visible around the windshield and doors and almost no where else. The resulting car weighed only 1,484 pounds. "Only 1,050 cars were ultimately produced as the production costs of the advanced monocoque meant the car was sold for less than it cost to build," the museum sign notes. Enormous Rolls Royce Meteor motor powered World War II tanks. 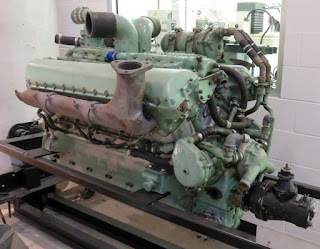 Next surprise: A Rolls Royce V-12 Meteor motor. An engine from a tank! It's a relative of the famed Merlin engine that powered the Spitfire and P-51 Mustang fighter planes. "The Rolls Royce Meteor was a British tank engine developed during World War II and was used in the Comet, Cromwell and Centurion tanks," signage advises. Using airplane motors in tanks might seem uneconomical, but the Meteor was a bargain. It left out the Merlin's supercharger, greatly simplifying casting. Since light weight was less important (in a tank!) some expensive light alloy materials were replaced with steel. Since reliability was less important, Merlin components rejected for poor quality could be used in the Meteor. In 1943, a shortage of V-12 blocks was met by dismantling surplus older Merlins to make Meteors. It's still a monster 27-liter motor. It holds 25 gallons of oil! Very rare, the Crocker was the best of pre-war American motorcycles. 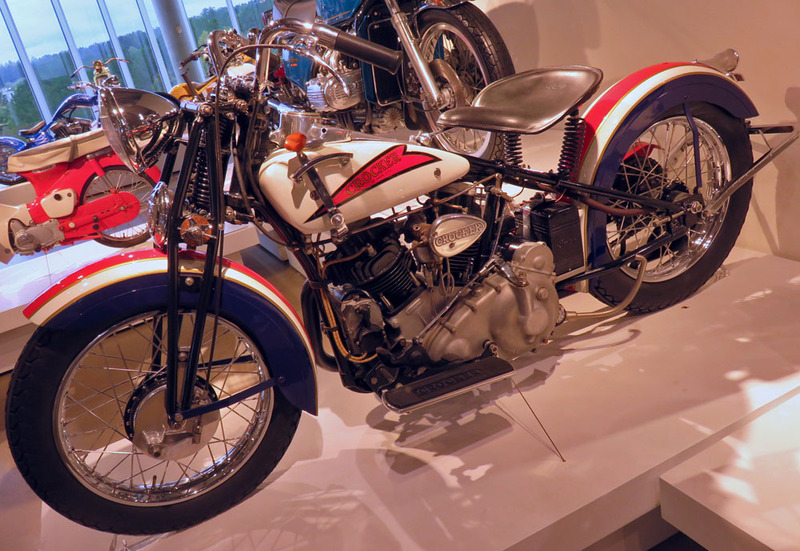 The 1938 Crocker V-twin is famed as the Duesenberg of American motorcycles. Only about 75 were built between 1936 and 1940, so I never expected to see one. 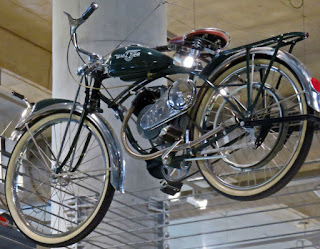 The work of Albert Crocker, who had built racing motorcycles, these were superb road machines, capable of cruising at 90 mph. Look closely at this little Honda. Does it seem slightly stretched out? That's to make room for the extra crankcase that turns the little speedster into a 98cc V-twin. Can you spot what makes this former Honda 50 so special? The 1974 creation of British engineer Allen Millyard, the SS100 claims all of 10.5 horsepower. A single seater, why does it have rear foot pegs? Undoubtedly so the rider can stretch out over the long tank for streamlining. 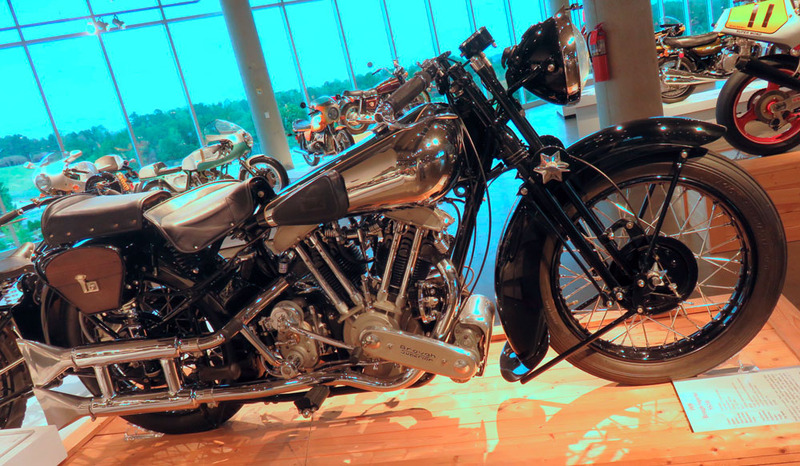 Here's another SS100: the 1938 Brough-Superior, looking every bit as superior as it was when T.E. Lawrence favored the brand. Broughs were assembled from parts — here a Matchless motor and Norton gearbox — but only the best ones. This one has front and rear Royal Enfield brakes. Only the best bits made for a Superior Brough. 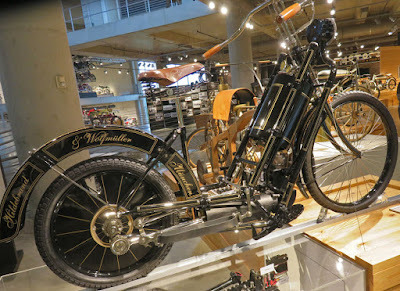 The 1894 Hildebrand & Wolfmuller, from Germany, was the world's first mass produced motorcycle. Some aspects of its design did not catch on. 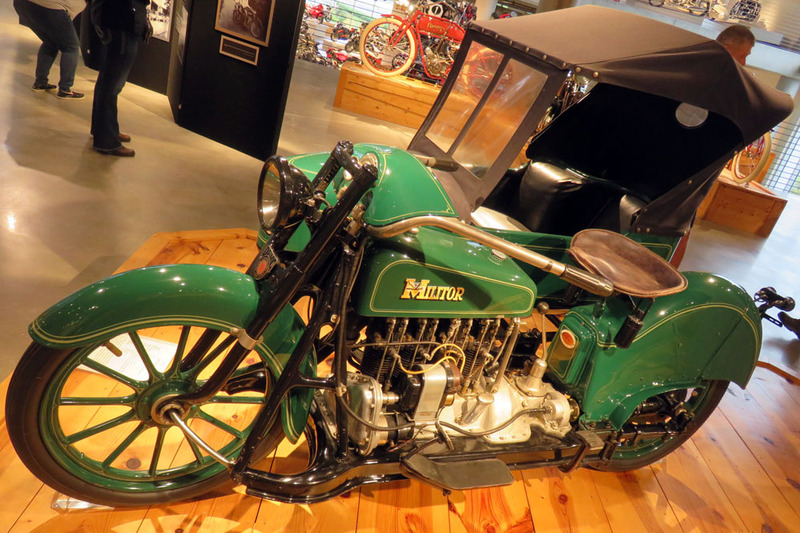 For instance, the piston rods operate on the rear wheel — it's in effect the crankshaft. If you want a different drive ratio you have to fit a different size rear wheel. It's complicated looking but you have to love the rubber bands. Who doesn't like a magnificent failure? The 1920 Militor (initially designed for the U.S. military) was both magnificent and awful. It seemed to lack for nothing. It had a sidecar, four-cylinder motor, front and rear suspension (telescopic on the front, leaf at the rear). Wheels were wagon style, with wooden spokes, and the frame was massive. A curved steel bar ran through the center of the front wheel to stabilize it. "Military might" never came mightier than the Militor. At 800 pounds the few Militors sent to the front in 1918 sank into the battlefield. But part of the fascination of any museum is seeing what worked, and what didn't, what became famous and what sank into oblivion. So I am not offended that the Barber's "Captain America" Harley-Davidson, displayed so proudly at center stage, is a replica of the motorcycle in the movie "Easy Rider." 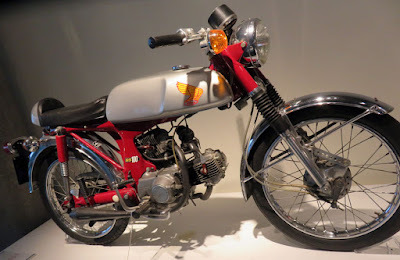 The 1960 Vincent Black Lightning on display is a replica as well, although "a very accurate replica," signage notes. 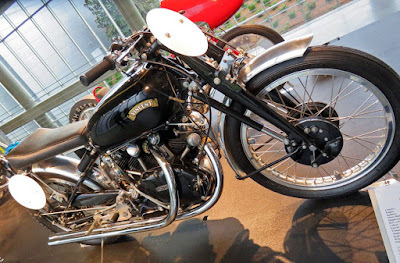 After all, the real Black Lightning (no more than 40 are reputed to have been made) was itself just a tuned version of the Vincent Black Shadow. Vincent Black Lightning was first to break 150 mph. But its looks mattered more. Our museum guide pointed out that what made these Vincents so influential was not just their speed or mechanical sophistication. Those have been surpassed. Oddly, what has lasted is the importance of the color black. Motorcycles, before the Vincent, were black only if they had to be. Otherwise they tried to be colorful and shiny. The "Black" Vincents made black cool. At the other end of the spectrum, a Whizzer powered bicycle. Great articles and photos. 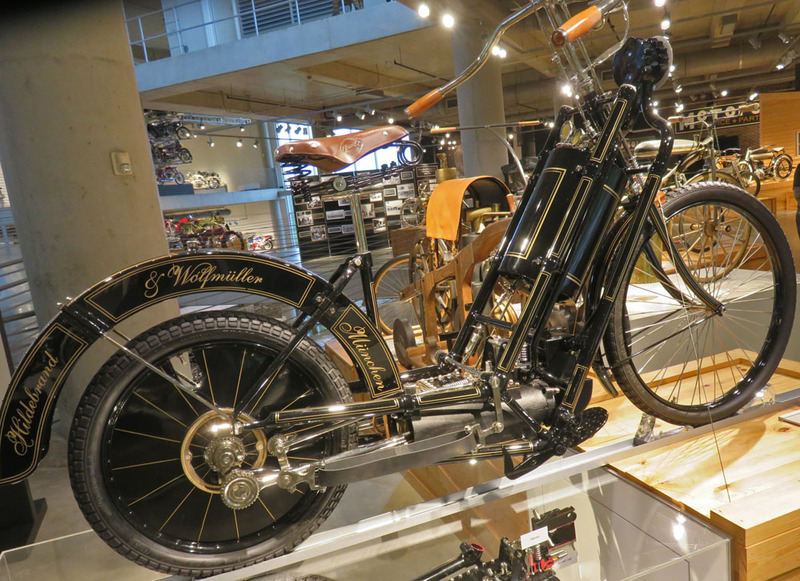 Now the Barber Museum is another bucket-list trip. Thanks for the great photos and your comments! Happy Thanksgiving, David!